Dear Parents and Carers, as usual there is much happening at Craigburn. We have enjoyed pleasant weather conditions over recent days where students and classes have been able to make the most of being outdoors before the long winter season sets in. This was especially the case today with the opening of our new playground. Thank you to all community members for your support and efforts with fundraising activities over the last few years with special acknowledgement to the fundraising committee leading the way. This fundraising support, coupled with a generous contribution from our OSHC service, has enabled the school to purchase the new equipment. It was satisfying and rewarding to see students enjoying their first play. Positive Learning Expectations – Teachers are currently working with students on the development of positive learning expectations based on our school values of Self Worth Caring and Responsibility. The aim of this exercise is to develop and use a set of common and agreed expectations for all students in the school. We look forward to sharing our work in this area and making these expectations visible throughout the school. 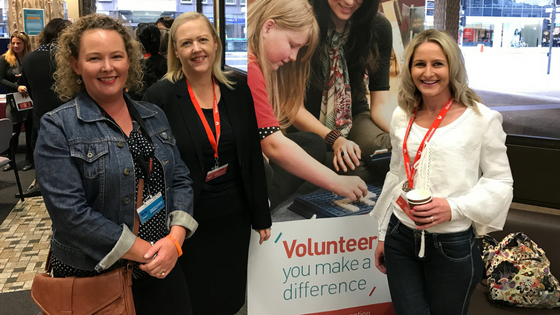 Last week we had a small team from our Governing Council who were invited to attend a DECD Volunteer Week morning tea to acknowledge the work of volunteers in school communities. At Craigburn we are fortunate to have extensive support from our community. Many thanks to Kerrin B, Jane S and Lisa S for representing Craigburn (as per the featured image). Winter School Sport has started and it is pleasing to see many students and parents taking great pride in representing Craigburn – whether it be for netball, soccer or basketball. Thank you to all parents who are coaching and managing teams. Best wishes to all teams for the season ahead. 3D Printing Earlier this year, we were successful in accessing a 3D Printing Project grant using the Makers Empire software. Teachers, Lisa Sporn and Andrea Grant are working on this project to explore how 3D printing can be creatively used in learning programs. We look forward to progressing our learning in this area. The Garden Buddies Club happens each week in the Environmental Learning Centre – the team of teachers and supporting parents are looking to prepare the garden beds for winter veggies (not too late). Team Assemblies are scheduled for next week. Classes and students are looking forward to sharing their learning with families and friends. The Reception to Year 1 assembly is set for Wednesday 24 May from 2.15pm and the Year 2, 3 and 4 classes are set for a 10.00am start. The Year 5, 6 and 7 assembly will be on Friday 26 May for a 2.00pm start. All assemblies are in the school hall. The Year 7 Canberra Camp is just over a week away. This year, I have the privilege of attending this annual tour of Canberra with Year 7 students and teachers. The Craigburn group will visit all of the iconic places in Canberra including the War Memorial, Parliament House, the Governor General’s residence and more. We will be sharing our adventures on our school Facebook Page. To finish off, we have unfortunately been experiencing a spate of graffiti and vandalism in recent weeks. If you happen to be on school grounds after hours and see any suspicious activity please contact the police. We have also increased after hours security patrols.